Following a campaign calling for a female subject to be installed in the square, Wearing went on to create a piece with touching, insightful detailing, including the incorporation of one of Fawcett’s own brooches which was scanned from an original belonging to the Fawcett Society and cast into bronze. 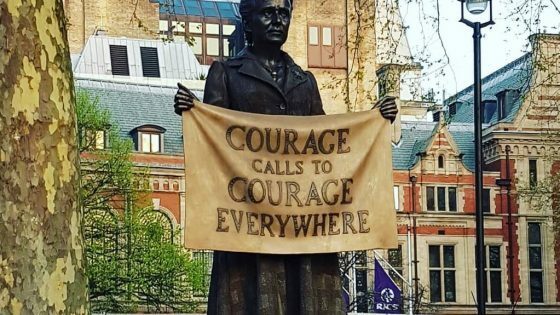 The statue holds a sign which reads “Courage calls to courage everywhere”, taken from a speech she gave after the death of fellow campaigner Emily Wilding Davison at the 1913 Epsom Derby. The statue has been commissioned by the Mayor of London with 14-18 NOW, Firstsite and Iniva through the Government’s national centenary fund. 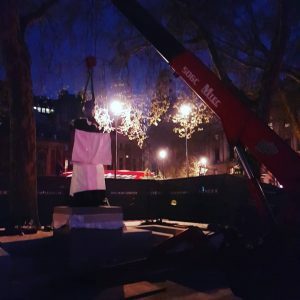 The installation was carried out in time for the centenary of the Representation of the Peoples Act 1918 in February, which granted some women over 30 the vote for the first time. To find out more about the sculpture visit the 14:18NOW website.